Wisconsin, like other states, faces serious challenges in the climate and energy arena. But we also boast more than our fair share of leaders who are employing creative and practical solutions for a brighter, cleaner future. The Wisconsin Academy has been exploring challenges and solutions as part of an initiative called “Wisconsin’s Climate and Energy Future.” The Wisconsin Academy convened nearly a dozen leaders at an Innovators’ Showcase at Discovery World in Milwaukee on April 29, 2013. Here’s a look at several of those featured at the Innovators’ Showcase. These Wisconsinites are proving that doing good (for the planet) and doing well (for the bottom line) can go hand-in-hand. Their commitment to the environment and their entrepreneurial savvy are not at odds, but rather deeply intertwined ways of doing business. Self-described “eco-entrepreneur” Sonya Newenhouse is passionate about her latest venture: developing a line of small, super-energy-efficient kit homes. She’s got an open-door policy—quite literally—when it comes to showing the prototype she lives in with her family in Viroqua. Newenhouse is so eager to have visitors learn about her aptly named NewenHouses that she’s issued a standing invitation for personal tours of her own home. Just call her mobile number if you’d like to drop by the cheery, two-story red house at 422 Hickory Street and have a look. While not everyone might be comfortable with visitors examining every nook and cranny of their home, Newenhouse relishes the chance to show people around. Newenhouse’s home is probably unlike any you’ve visited. Most remarkable is its lack of a furnace—which seems almost unthinkable at first, given Wisconsin’s bone-chilling winters. Yet the airtight dwelling is 80% to 90% more energy efficient than conventional homes. There’s a 1300-watt electric heating system for the rare times it’s needed. But “we only ever need to turn on half of the heat system in the house, so it’s like half of a hair dryer” in terms of energy consumption, says Newenhouse. Top-quality windows, hefty insulation, and heat recovery ventilation (HRV) systems are key to building passive houses like the NewenHouse. As the website of the International Passive House Association (headquartered in Wisconsin’s sister state of Hessen, Germany) describes them, passive houses “make efficient use of the sun and heat recovery so that conventional heating systems are rendered unnecessary throughout even the coldest of winters.” In the summertime, strategic shading helps keep these homes cool. 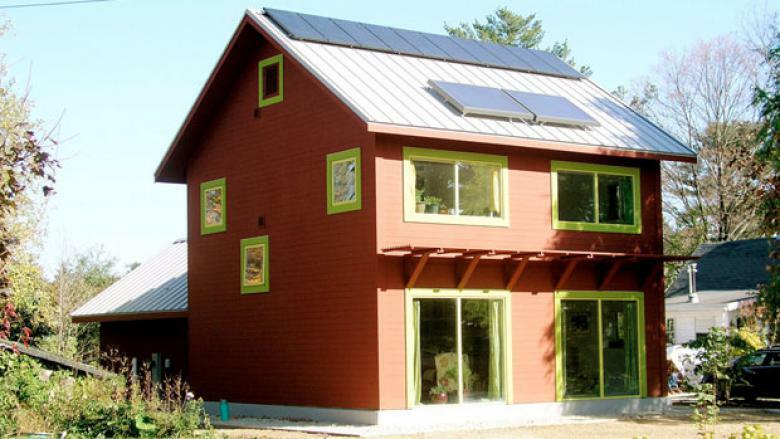 While passive houses sometimes cost more to build than conventional ones due to the high-quality materials needed, they save money in the long run due to drastically reduced energy needs—benefitting both the homeowner and the planet. While news stories have described the NewenHouse as “tiny” and “uber-compact,” this assessment may be more of a reflection of the bigger-is-better mentality that permeates much of new home construction these days. Until about 1950, 900-square-foot homes were the norm. Since then, new home sizes have increased approximately 300 square feet per decade—despite declining family size. Today the median size of a new home is around 2,505 square feet, according to the U.S. Census Bureau. Though Newenhouse built her 970-square-foot home with energy efficiency and living lightly as her top priorities, one shouldn’t get the impression that it is a drab or austere place. Sustainability, function, and fun find harmony in this bold prototype, which Newenhouse shares with her husband, Cecil Wright; their five-year-old son, Addisu; and roommate Bjorn Bergman. Outside, the building sports red siding with yellow and green trim. Inside, you’ll find abundant built-in storage, deep windowsills, and colorful paintings by acclaimed Wisconsin artist Charles Munch. If you can’t make the trek to Viroqua, you can tour it virtually via Newenhouse’s YouTube videos, which show both the completed home and various stages of construction. “Visitors are surprised at how big it feels, and also how quiet and peaceful it feels. All of the insulation and the airtight, triple-pane windows make it very quiet and soothing. There’s no furnace noise, and it’s bright because of the large, south-facing windows. It’s lovely, even on a rainy, overcast day. There’s a complete connection with the outdoors. You can’t be in a bad mood here,” Newenhouse says with a laugh. At 484 square feet, the first floor’s open plan maximizes a feeling of spaciousness and brings the home’s residents together. For extra room to accommodate overnight guests or store camping and sports gear, the home also has a 270-square-foot stuga (the Swedish word for cabin) connected to the main dwelling by a breezeway. Newenhouse observes that much of what we typically store doesn’t require heated space, just protection from moisture and mold. The NewenHouse stuga includes a root cellar, general storage area, porch, and sleeping loft for guests. With its wood-burning stove, the stuga can be heated up in a jiffy if guests arrive in cold weather. The NewenHouse kit homes concept is the latest in a line of entrepreneurial endeavors from Newenhouse, a dynamo with MS and PhD degrees in land resources from the Nelson Institute for Environmental Studies at the University of Wisconsin–Madison. She founded Madison Environmental Group, a consulting firm that she sold in 2011 in order to focus on the kit home concept. Newenhouse is also president of Community Car LLC, a Madison-based company with more than 1,300 members that seeks to address air pollution and transportation equity though easy and affordable car sharing. The varied facets of Newenhouse’s career all reflect her commitment to tackling the planet’s climate change and energy issues. So far, Newenhouse’s experiment seems to be working: the NewenHouse prototype has surpassed her energy-efficiency expectations. The next step for her company is to market plans for one-, two- and three-bedroom versions, along with specialty building materials that are not always readily available: triple-pane windows and doors, special building tape, efficient ventilation systems and certain paints and finishes. NewenHouse kit-home purchasers will also have access to consulting services and a community of like-minded homebuilders and green-living enthusiasts. Although Newenhouse’s work is focused on global problems, the way in which she addresses these problems is on a personal, local scale. The beef produced by Fountain Prairie Farms of Fall River, owned by John and Dorothy Priske, is highly sought after by restaurants and consumers alike for its flavor and tenderness. Their meat is served in some of the region’s best restaurants, including L’Etoile and Graze, both owned by James Beard Award-winning chef Tory Miller and his sister, Traci Miller. But producing delicious food is just one part of the Priskes’ mission; being good stewards of the land is equally important. In fact, the couple were named Wisconsin Land and Water Conservation Farmers of the Year in 2011 by the Wisconsin Land and Water Conservation Association. The same year, they also received a John Nolen Award for Excellence in Ecological Restoration Practices, part of the University of Wisconsin Arboretum’s Leopold Restoration Awards program. The quality of the Priskes’ meat and their meticulous attention to the health of the land are intertwined. The couple credit their long standing relationship with eco-conscious chef Tory Miller as a key ingredient to making their farm such a success. “We wouldn’t be where we are today without the support of L’Etoile and Graze,” they say. Having the seal of approval from a renowned chef—particularly one closely associated with the movement for local, responsibly sourced ingredients—has been a boost for their operation and helped them continue the sort of farming that feeds people not only physically, but in terms of feeling connected to the land. In turn, restaurants like L’Etoile can offer their customers a superior product while supporting local farms. Fountain Prairie Farm, which also includes a bed and breakfast in the couple’s 1899 Victorian farmhouse, incorporates a range of climate- and energy-conscious practices. The Priskes raise Highland cattle—a hardy Scottish breed distinctive for their long, wavy coats—and manage their pastures through a practice known as rotational grazing. These grass-fed cattle move from paddock to paddock, never grazing in one area long enough to eat the vegetation all the way to the ground. “By design, we figure out how much foraging is going on, and how long to keep them in a certain paddock. They eat, trample, fertilize and move on,” says John Priske. After that, a paddock is allowed to rest for at least 21 days. The vegetation that remains soaks up the sun, resulting in lush growth that the cattle can return to on a future rotation. The Priskes have also improved the land on their 280 acres by restoring a tall-grass prairie and wetland. They helped rejuvenate the prairie with over twenty species of grasses and plants. The Priskes helped hand-harvest the seeds for the plant varieties they wanted. They also planted hazelnut bushes and white oak, red oak and burr oak trees. These plantings have, in turn, attracted a multitude of birds and waterfowl to the property. “A lot of nice things are happening to the land, in addition to having it looking, feeling and smelling good,” says John. Wind turbines power the Priskes’ operation—and then some. Turbines on the property produce more than double the energy they need, meaning the Priskes enjoy a credit on their monthly energy statement rather than a balance due. The turbines were installed in 2007 or 2008, says Dorothy, when incentives and tax credits made experimenting with alternative energy sources attractive. Like Sonya Newenhouse, John and Dorothy Priske feel that inviting people into their home is the best way to share information about what they do. Not content to simply sell their products to restaurants and consumers, the Priskes have hosted a number of on-the-land dinners and pasture walks (some with over two hundred participants) to help people learn about sustainable farming practices. In order for businesses to successfully “go green,” owners and operators need to educate themselves on best practices. Having a core group of established experts and a peer network from which one can draw wisdom and good ideas are two keys to success. Around the time Eggert was finishing his master’s degree, he spoke to Professor Thomas Yuill, who was then director of what is now known as the Nelson Institute for Environmental Studies at the UW–Madison. Eggert expressed interest in seeing a course in sustainable development, and Yuill suggested that Eggert, who was already working with the DNR by this time, be the one to teach it. From those beginnings, the UW’s first class in sustainable development was born in 1995, with Eggert teaching it as an adjunct lecturer. Sustainability as a concept was beginning to gain traction at this time, and student interest in the subject was high. The class was renewed and shifted from the Nelson Institute to the School of Business. In 2008, Eggert and Dan Anderson, a professor in the school’s risk management area, floated a proposal for a graduate certificate. This lead to the development of the Graduate Certificate in Business, Environment, and Social Responsibility (BESR) program at UW–Madison. The program guides students in both the strategic application of business principles to social and environmental challenges, as well the integration of sustainability practices into management decision-making. What distinguishes the program is that it’s not aimed solely at students in the School of Business. Graduate students from any area of the university can add the certificate on to their graduate degree. Non-business students completing the program have included those from engineering, interior design, and environmental studies. Eggert’s teaching goes hand-in-hand with his role as executive director of the Sustainable Business Council (SBC), which provides Wisconsin businesses with a network to share best management practices and sustainability resources. Among its offerings are a major conference held each December and the Green Masters Program, which recognizes businesses exhibiting leadership in sustainability issues. Businesses of any size, from any sector, can apply for the Green Master credential through the SBC website. In order to be certified, businesses are scrutinized for specific sustainable actions in areas such as energy use, water consumption, supply-chain practices, waste management, and community outreach, then graded through an objective, points-based program developed in conjunction with the University of Wisconsin. The program also strives to spur these businesses on to even greater sustainability by making them part of a network of like-minded enterprises. Watertown-based Berres Brothers Coffee Roasters is a good example of a Green Masters success story. The company reduced the amount of packaging film it uses to wrap bulk shipments, which saves them money while also reducing the amount of film that winds up in landfills. By testing its wholesale process to determine the minimum amount of necessary packaging film, Berres Brothers found that it could eliminate 3,000 to 4,000 feet of film per month. The SBC also provides online information resources for those striving to incorporate more sustainable practices into their everyday operations, including dozens of detailed case studies of Wisconsin businesses like Berres Brothers. These case studies are “very specific, very narrowly drawn improvements and actions that lay out the costs, benefits, who [the business] worked with, how long it took, and so forth. We are providing businesses in the state direct access to other businesses who have done what they’re thinking about doing,” says Eggert, noting how this type of peer learning helps make sustainability improvements more achievable. In Eggert’s view, Wisconsin’s green business future is bright as long as we have leaders willing to make substantial changes. He holds up historical examples like the late S.C. Johnson Jr., the first private-sector head of the President’s Council on Sustainable Development under President Clinton, to current leaders in such iconic Wisconsin industries as paper and brewing.